Rachel Carson's classic essay, first published in 1956, will inspire adults and children alike by reminding us "the world is always fresh and new and full of wonder," if we only have the eyes to see it. William Neill's images of nature's details and intimate landscapes illustrate and enhance the beautiful prose. 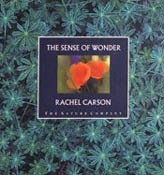 Published in 1990, The Sense of Wonder is now out of print.